2019's BEST Bidet Toilet Seats Reviews - Your Ultimate Buying Guide! When it comes right down to a battle between the best of the best, the model that comes out on top is the TOTO Neorest because this model will make you feel like you’re sitting on a throne in your home bathroom. It comes with the same features you’ll find on products used in upscale hotels and spas, including a heated seat and a remote control. If you want a warmer seat, you can turn the temperature up, but you can also turn the heated seat down. The included remote control provides you with total access to the features of the Neorest and lets you flush or change the seat temperature from across the room and before you sit down. 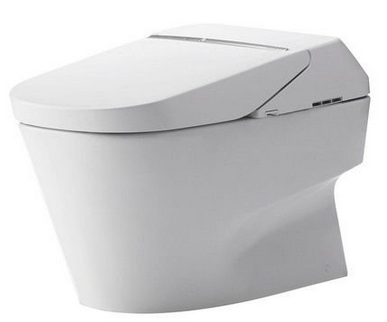 TOTO added its patented SoftClose seat, which drops the seat down slowly to prevent any bangs or other loud noises. It features an elongated bowl with a skirt around the base too. Also suitable for use as a bidet, this model will help you leave the bathroom feeling as clean as you want. With the remote control, you can select an oscillating spray that moves water slowly around your body or a pulsating spray that removes any waste or debris from your skin. It also comes with a hands-free flushing design to keep your hands clean and a dual flush option that uses between 0.8 and one gallons of water per flush. KOHLER has a strong reputation for making some of the top bathroom products in the world today like faucets and shower heads, and its Karing is one of the top options for anyone who wants a toilet that also works like a bidet. This is a one-piece model that has an integrated skirt designed to protect the plumbing and hardware inside, but this skirt also gives it a cleaner and more modern design. The Karing comes with a seat that acts like a lid, which automatically closes after you use it. The built-in bidet comes with three different features that include a self-cleaning wand and a deodorizer. This rod makes it easy for you to clean yourself as well as the inside of the bowl, and the deodorizer releases a pleasant scent into the air that masks odors without leaving behind an artificial fragrance. It also comes with an air dryer that leaves you feeling completely dry without the need for any TP. Its self-cleaning wand turns itself on as soon as you flush to clean the bowl on its own. The Karing also comes with settings that you can personalize for yourself and one other user based on your preferences. KOHLER added its Power Lite setting to use just 1.28 gallons of water per flush and added a built-in nightlight too. One company you may not know much about is BioBidet, which is the manufacturer responsible for making the IB8635, which gets average reviews from customers and is a more affordable option than the models produced by KOHLER and TOTO. This model has a much lower profile than the others do to force you into a slightly squatting position, which is the position experts recommend using to reduce pressure and strain on your body. It’s a one-piece model too that includes both a molded base, seat and tank in a single piece. The dual nozzles inside perform two different functions when using the bidet and allow you to choose from a setting designed for men or one for women. Its following wash setting for men uses water at a low pressure to wipe away waste and debris with a little fresh water, and the feminine setting does the same thing for women but changes the aim and direction of the water. Either setting lets you help the environment because you don’t need to use TP. Other features on this model can help you feel more at home in your bathroom. It has a deodorizer to hide bad odors, an air dry setting to dry your wet skin and a heated seat to keep you warm and comfortable. This model features an automatic wash setting and comes with a digital body sensor and a wireless remote control. Save yourself some money and time with a toilet seat that acts like a bidet and works with your existing model like this one from Lotus Hygiene. The ATS-1000 installs so quickly and easily that you can do it yourself or hire a contractor to do it for you, and you can choose between a round or elongated design to match your current bowl and seat. It first right on top of the seat and is compatible with most popular brands. A PureStream function lets you treat constipation at home without taking any medications, and this feature uses a small amount of water and air pressure to help you finally go. It comes with a built-in air dryer that has its temperature control too, which lets you pick the temperature of the air that dries you. You’ll find commands that correspond to each setting on the side of the seat, but you can access those settings via the included remote control also. Also included is a deodorizer that uses real carbon, which is a natural material that blocks odors. This deodorizer does more than just mask odors though because it also traps those odors inside the seat. Lifting the lid reveals a comfortable seat with its heating element that you can adjust the temperature on too. Another option for those who already have a toilet that is in excellent condition is this remote control seat from Novita, which turns almost any seat and bowl into a bidet. It comes with a built-in remote on the side of the seat that uses buttons you can just press down on to access the settings, and those buttons have a soft texture that lets you use less force to reach those settings. You also get a separate wireless remote control that you can use from anywhere in the room and without taking a seat first. Suitable for use in bathrooms used by kids or adults, it comes with a built-in nightlight that uses LED technology to increase the brightness of the light. Novita used that same LED technology in the remote control to give the digital display a backlit design to help you more clearly see what you need to look at. You can lift the seat with just one touch to lift the lid or set the top to raise and close automatically for you. A heating element hidden inside provides you with instant hot water each time that you use the bathroom, but it has an air dryer that dries you off quickly with warm air too. Two nozzles inside the seat itself use warm water to clean you off at the setting that you picked. It also comes with a three-year warranty from the manufacturer. This model from Blooming is a good option for those looking for just a seat because it has a round design that is compatible with most brands and a remote control for accessing and using all the settings without actually sitting on the seat. It also has a clean and white finish that matches toilets made of porcelain and other materials to give your bathroom a complete look. This model has push-button controls on the seat too, but those controls remain hidden behind the lid when it’s in a lifted position. Designed to work on both one-piece and two-piece models, it comes with a three-year warranty that covers all the parts as well as the remote control, and this warranty covers any labor costs as well as part costs. A nozzle inside uses aluminum that lasts longer than nozzles made from plastic and similar materials. You can use this nozzle on a pulsating or massaging setting. The remote control lets you change the nozzle setting as well as the temperature of the seat, which heats up when you sit down. This model comes with a deodorizer that masks and eliminates odors in the room and an air dryer that dries you off. You also get a built-in nightlight that helps you see the bowl in the dark. The Swash 1000 from Brondell transforms your bathroom into a bidet and is one of the more affordable options for your home. Though it costs less than competing models, it comes in more options that let you choose between one with an elongated or round design and between a biscuit or white finish to match both the size and color of your bathroom. All models use a ceramic heating element that pushes water through the heating system to bring it up to temperature as fast as possible. Two nozzles inside use stainless steel for added durability and are adjustable to help you direct the angle and flow of the water. Water pressure controls on the included remote control change both the speed and the temperature of the water that reaches your skin. The remote also gives you access to the temperature settings for the heated seat. While there are some options that you can choose from in regards to toilets that come with a bidet and seats that work like a bidet, you can’t go wrong with the Neorest from TOTO. With a low flush rating, it uses no more than one gallon of water per flush and will still eliminate waste without wasting water, and you can use the dual flush buttons to use less water based on the total amount of waste in the bowl. The automatic flush feature lets you flush down that waste without touching the tank and getting your hands dirty. The top reason to choose this one is that it comes with an integrated bidet. You can choose between two different spray settings to clean your body the right way. It also comes with a heated seat that lets you change the maximum temperature used and a remote control. Do You Need a Whole New Toilet? One of the first questions that you need to ask yourself is whether you need an entirely new toilet. The model that you already have in your bathroom might work well and be in good condition, which means that you can add a seat that works like a bidet to that model. If you see cracks in the bowl, it wobbles when you sit down, or the base keeps leaking, you’re better off buying a new set. What is the GPF Rating? GPF is gallon per flush, which is how much water the model uses when you flush it. High efficiency and ultra efficiency models use significantly less water and can have a rating of under one gallon per flush. These products save you money on your water bills and keep you from wasting water too. You’ll also find models from KOHLER, TOTO and other companies with a dual flush mechanism, which has two buttons. One button uses less water for thinner and liquid waste, and the separate switch uses more water for thicker and solid waste. These can have a rating of around 0.8 to more than one gallon per flush. How Will You Power It? You also need to consider how you will provide power to that product. While some come with a cord that you can plug into a nearby outlet, others require that you actually hard wire the product into the electrical system of your home. Those that you can plug into an outlet will work with an extension cord to help you reach an outlet further away. What are the Wash Settings? Wash settings are the built-in settings that provide you with the clean feeling that you want. A next wash is one designed for men that puts the nozzle at an angle further towards the back of the seat. With a feminine liquid, the nozzle moves up slightly to reach all areas of a woman’s lower body and privates. Models that require less maintenance are more popular with shoppers today because they don’t want to spend a lot of time cleaning the inside of the bowl. TOTO and other companies make products that come with a self-cleaning wand that automatically cleans the bowl for you. Others have to rinse holes along the sides of the bowl that shoot water down at a high pressure to clean the bowl when flushing.